Astronomers using the National Science Foundation's Very Long Baseline Array (VLBA) of radio telescopes have discovered a cloud of gas apparently being struck by a jet of ultrafast particles powered by the energy of a supermassive black hole at the core of a galaxy 450 million light-years away. A collision between the jet of subatomic particles and the gas cloud caused flickering of radio waves at a particular location in the jet during a 16-month series of VLBA observations. "This cloud, about 25 light-years away from the black hole, represents a 'missing link' that will help us understand the complex regions around the central black holes in active galaxies," said Jose-Luis Gomez, the team leader. Gomez worked with Alan Marscher, Antonio Alberdi, Svetlana G. Jorstad and Cristina Garcia-Miro. Gomez, Alberdi and Garcia-Miro are from the Astrophysical Institute of Andalucia in Granada, Spain; Marscher is from Boston University and Jorstad represents both Boston University and St. Petersburg State University in Russia. They reported their results in the Sept. 29 issue of the journal Science. The researchers produced a "movie" of changes in the galaxy's jet over the 16-month observing period. "This movie is the result of perhaps the most complete monitoring of such a jet ever done," said Gomez. Active galaxies come in a variety of types, including Seyfert galaxies, radio galaxies, and quasars. All are believed to harbor a giant black hole at the center. Black holes are concentrations of matter so dense that, within a certain distance, not even light can escape the gravitational pull. In active galaxies, material drawn toward the black hole is thought to form a disk of material that tightly orbits the black hole. Such an "accretion disk" is believed responsible for generating jets of material that, drawing on the black hole's gravitational energy, are boosted to speeds nearly equal to that of light. In the past, astronomers have found evidence for dense clouds of gas near the accretion disk that are presumed to be moving rapidly. 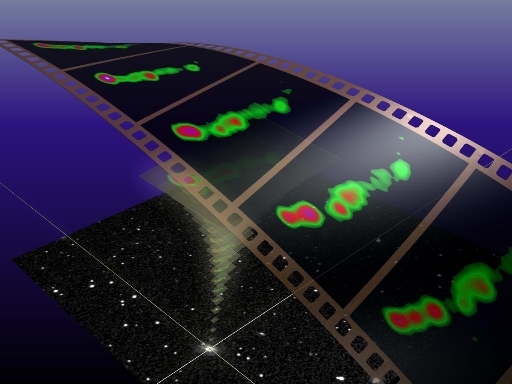 Farther from the black hole, other, less dense gas clouds show evidence of less-rapid motion. "We're not sure whether these clouds are moving away from the black hole, toward it, or in some random manner," said Gomez. "The gas cloud we have found in 3C120 is isolated and intermediate in distance from the central black hole. With further study, we think we can determine just which way it is moving, and thus help answer the question of just how these gas clouds in the central regions of active galaxies are behaving." 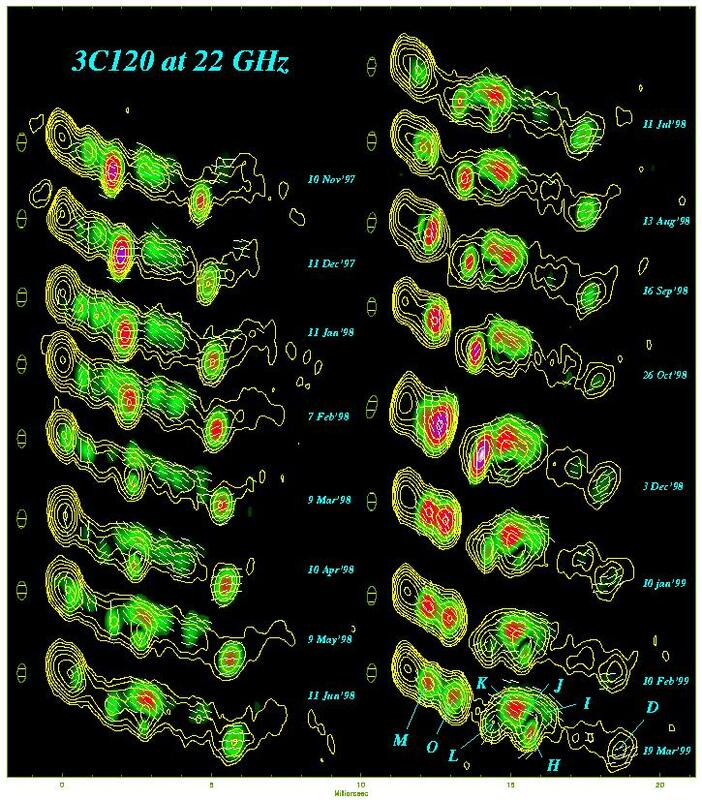 In their study using the VLBA, the astronomers were able to track the motions of concentrations, or "blobs" of material in the jets spewn out from the core of 3C120. At a distance of about 25 light-years from the presumed location of the central black hole, they noted that some of the blobs seemed to turn on and then off over the course of a few months. They interpreted this as evidence of a collision of the jet particles with the gas cloud. Other evidence showed that the shock of the collision affected the magnetic field of the blob. They also saw evidence that the "nozzle" of the jet may change its direction slightly, changing the place where the jet strikes the gas cloud. The VLBA is a continent-wide radio-telescope system, with one telescope on Hawaii, another on St. Croix in the Caribbean, and eight others in the continental United States. Part of the National Radio Astronomy Observatory, the VLBA offers the highest resolving power, or ability to see fine detail, of any telescope available. The National Radio Astronomy Observatory is a facility of the National Science Foundation, operated under cooperative agreement by Associated Universities, Inc. The work at Boston University was supported in part with funds from the National Science Foundation.